Chopin’s Etude Op. 25 No 5 is better known as the “Wrong Note” Etude. Not because it encourages the pianist to play the wrong notes, but rather because the opening segment is riddled with minor chords and notes that are a half step apart. Friday night’s loss to the Rays also featured a lot of wrong notes, one of which was seemingly a half step off. But it was no work of art. The opening segment of this game wasn't particularly harmonic either. Lance Lynn's control was crummy, and has been all year: he's now had 15 walks in his 15 innings as a Twin, which is horrendous. He did, however, mostly hold things together and his game score is, if one wants to be kind, a little unfair. He entered the seventh inning trailing 3-2 and with a game score of 52, which would have been at least average. But Twins manager Paul Molitor kept him out there a few pitches too long, allowing two baserunners without getting an out. They both scored as part of a couple of discordant outings by Taylor Rogers and Ryan Pressly. The Twins trailed 6-2 before the inning was over. However, then Rays manager Kevin Cash matched Molitor's minor keys with his own, committing the same sin: leaving a pitcher in a bit too long. In this case, he tried to get through the 8th inning with right-hander Sergio Romo, despite facing left-handed hitting Eddie Rosario with the bases loaded. To make matters worse, he had southpaw Ryan Yarbrough (who literally had not given up a hit versus a left-handed hitter yet this year) warmed up. That went about as bad as it could go. Perhaps to redeem Cash's decision, Yarborough finally gave up a hit versus a left-handed hitter when Max Kepler gave the Twins a ninth-inning lead. But then the inharmonious notes started happening ON the field. Fernando Rodney hit Carlos Gomez with a pitch, let him steal second, and then a literal "bad hop." And the whole movement ends with a critical bad half step. Zach Duke seemingly induced a ground out to end a scoring chance in the tenth inning, but his foot can't find the first base bag after a toss by Joe Mauer, and the Twins lose. There is no shame to losing to Rays ace Chris Archer. 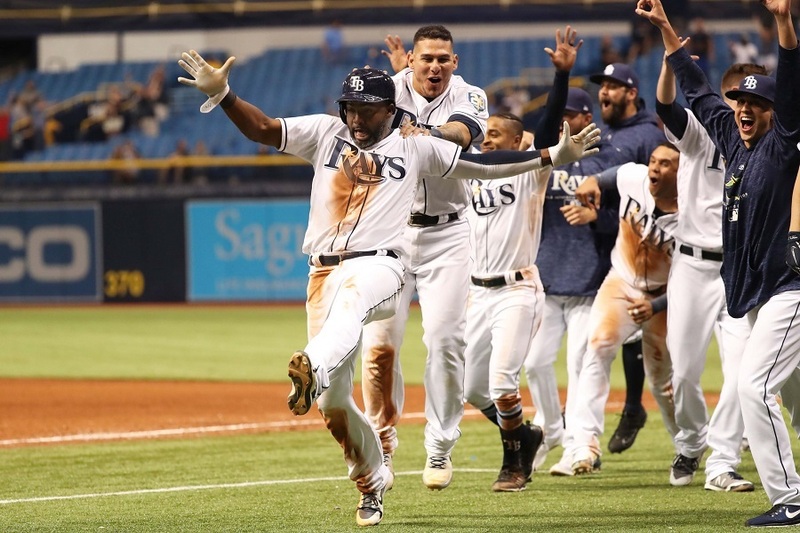 The Twins entered Friday night’s game 8-5, while the Rays entered it 5-13, and yet the Rays were slight favorites in Vegas yesterday. But the starting pitchers were not the difference in this game, and it's not clear that the relative quality of each team was either. Friday night's game came down to two bullpens and a lot of wrong notes. That call was very bad. Has an inning ever gone smoothly with Duke pitching? Nobody deserves more criticism than Molitor. Players make errors, and give up hits. Molitor made a conscious decision to send Lynn back out for the 7th. Totally agree. We have a closer that gives up hits to the tune of around a .350 BA against, and he keeps running the guy out there, with Reed shining! Rodney, Lynn, and Duke. Walks walks, walks. Hit batter scores, walks score. So much for a front office that are pitching experts. There is a reason the Cards were done with Duke and Lynn. And Grossman in the outfield again? Thanks MOY. What a waste of a great comeback. It was in the bag. And Archer.... not the Archer of last year. He has been horrible. The decisions Molitor is making are definitely based on hope instead of savvy, and not on attention to who is reliable right now. That is on him, in my book. Not a great night for Mollie.He seems to have some conceptions of his team that are not quite accurate right now.I am not sure why he doesn't ride LaMarre's hot bat and his bullpen use has been curious at best.On the other hand, the players seem to have some rust in the field. I must be blind then. I watched the same replays. I couldn't tell if he was up against the bag, or just next to it. Very close up next to it, for sure. It is obvious to me that he couldn't tell if he had touched it, felt it, or he wouldn't have tried to retouch it! He missed the bag. He should have clearly stepped on the edge, then there would have been no question. Duke beat the runner there, and needed to complete the play. It is similar to the replays of whether there is space between the tip of the toe and the three point line in basketball. Duke needs to step on the base, not try to nuzzle up next to it! For this game to come down to the failures of Lynn, Rodney, and Duke is all on them, and the manager that put them in, or left them in, the game at the time(s) he did, when he had better options. The FO improved the team by acquiring these players. Lynn is way better than Hughes. It’s still early, he can rebound, or one of the many reinforcements that aren’t quite ready yet can take over. It’s a one year deal. But Molitor has made it abundantly clear with his actions that he has no intention of using a LOOGY correctly. So, that's still on the FO as well. Tough loss. If that groundout by Miller doesn’t bounce ten feet in the air off the mound, the game is over. Morrison getting a homer and another deep fly - very promising. I don't mind the call. Sure I would have liked for it to go our way but we just need to play better.We certainly can. It seems like the pitching staff has a different approach this year, which may be contributing to more walks.Maybe as the staff get's into the groove there will be less walks.Either that or we need to challenge hitters earlier in the count. i guess in “the buck stops here” sort of way, but not in the “roles and responsibilities” way. FO can coach and provide all the data and suggestions but if they start dictating to Molitor how to perform his role, it makes it pretty difficult to recruit the next manager. Using a LOOGY as a LOOGY is on the manager. I'm usually one to hold umps/refs accountable for bad game changing calls, when others say the team should've done more in the first place. In this case, the latter is right. When you play baseball poorly in terms of fundamentals (errors, too man walks, hitting batters), you leave yourself open to that. Compound the facts that Molitor continues to make repeated head-scratching bullpen moves and they (someone--Falvine?) insist on giving Rodney the ninth despite the warnings of every down to my three-year old and you have the makings of a problem. I'm nowhere near jumping ship right now. But it's extremely frustrating for a team likely fighting tooth-and-nail for the last wildcard spot to be dropping games like these. This game literally might be the difference between making and missing the playoffs. Not at all suggesting they micromanage Molitor. What I mean, is they chose to bring Molitor back, and they know he will not use a LOOGY. So, they have/had two choices. Hire a manager that will use a LOOGY. Or, don't sign a LOOGY, when you know your manager won't use him properly. I like Grossman as a hitter (when he's not in a slump) but why Grossman is playing outfield instead of LaMarre is the puzzle for me.I know the Rays had a right-handed pitcher, but right now I don't think Grossman is even hitting .100 and Lamarre seems to be hot, not to mention a better outfielder. Duke. Rodney. Lynn. These new additions have been disappointing. Sano seems to have basically said "screw it" and plans on literally hitting a HR or striking out every time. Rosario and Kep, gotta love 'em. Let's get Buxton back and get the OF together again! Twins can still take 2-of-3 from these guys, and they should. This also confuses me. I saw this in Puerto Rico and thought "okay, maybe Molly's playing the veteran for the big nationally televised affair" (that was the only way I could justify it). LaMarre should be in the OF, not Grossman. Disconcerting to see Sano strike out against Romo's frisbee sliders. He has to do better in that situation. Walking the number 9 hitter in the 10th to get lefty-on-lefty with Denard Span? And, got some bad breaks. At least the Twins are getting some clutch hits. I'm in the minority, but i appreciate that Molitor is making lineup decisions based on the larger sample size. I simply don't believe you can predict when a hot or cold streak will start or end. To me, it should take more than a few dozen plate appearances earn or lose playing time. Agree with everyone bashing on Molitor. His mistakes started before the game even began. Grossman has no business starting on a team hoping for the playoffs. When you're best skill is walking, you probably aren't that good of a player. He also has the defensive value of a parked car. Lynn going out for the 7th was stupid. Let Pressly take the entire inning. Rodney should be done at closer. but we figured that before the season started. Having a closer is stupid, but if we insist on having one it should be Pressly, not Rodney. No reason to not let Reed take the 9th too tonight, as he only threw 8 pitches. I'm hoping when Buxton is reactivated Grossman is that man out, and when Hughes is brought up Kinley needs to be let go. No reason to play with a 24 man roster. Very frustrating loss. Go Twins. Quoting Mr. Brooks: Disagree on that one. Morrison, Sano, Grossman have looked terrible. It would have been too easy to at least gotten LaMarre in the lineup last night. Or drop those guys down. Adrianza could have started instead of Sano, who has been beyond futile against Archer. Also, let's try calling up this Garver kid and giving him a look once in a while. Bit I also maintain Molitor lost that game last night. Sending Lynn back out for the 7th was so obviously wrong, so unnecessary, and such a predictable disaster. I don't hold Rodney against him, though. Rodney was a bit unlucky last night, and in any case if you're going to hold someone accountable for Rodney, it's Falvine. LaMarre doesn't have a "hot bat". He has struck out a lot, has no extra-base hits and literally every ball he's put in play has happened to not get caught. He's showed weakness in the form of striking out, a lack of strength with no XBH and he's been lucky. If we're going to get mad at Molitor for not taking statistics into consideration, we need to be consistent. The underlying numbers on LaMarre clearly show that his hot streak is a mirage.